And there’s no hospitality like Malay hospitality. 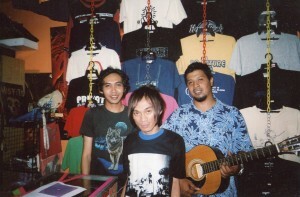 I met these aspiring rockers in the central bazaar in Kota Bharu, Malaysia. I stopped to hear one of them play that guitar. They noticed me, and I excused myself by saying that I play too. He handed it to me and offered his seat. One asked if I knew any Deep Purple–one of my all-time fave rock bands. Another asked if I knew any Allman Brothers, and I was thinking, “You are my brother!” As I played a song, the daily call to prayer from the neighborhood mosque 2 blocks away pierced the air. I immediately stopped, and we were all silent throughout the call. We resumed our rock out session as though were never interrupted. The call to prayer from the mosque’s minaret (my most recent post) is a feature of daily life far beyond its Middle Eastern homeland. But Malay and other Southeast Asian cultures also have very rich landscapes, and they’ve blended with Islam in ways that make Southeast Asian Islam as underappreciated as Chinese Islam. Malays take pride in their Islamic heritage, but many have mixed it with local animistic beliefs, spirit cults and lore about magic. Many modern city dwellers have taken a more strict approach to the faith, and they’ve tried to get rid of these older practices. But the Malay Islamic landscape is as diverse as Southeast Asian cultures are in general. Many beliefs exist side by side throughout Southeast Asia. This region has had an abundance of life forms and cultural interactions since ancient times. These guys can rock, fall silent and then rock again, and shift between these states as smoothly as a boat on a river. The call to prayer still punctuates daily life in Kota Bharu, but it shares a very dense landscape full of pop culture, older beliefs and natural forms. Malays and other Southeast Asians learn to navigate all patterns with grace. This makes the Malay world and the rest of Southeast a feast.